Plochmann Lane: Levon Helm to be buried @ Woodstock Cemetery. 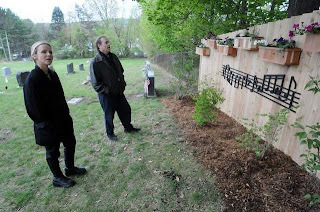 Levon's burial today @ Woodstock Cemetery, the same cemetery where Rick Danko is buried, but as previsously misreported, Levon is not being laid to rest directly next to Rick. Levon will be buried on a hill sort of overlooking the cemetery somewhat SW of Rick's burial location. The notes you see in the article picture are stained opening notes to The Band's "Life Is A Carnival" & were crafted & stained by old Woodstock friends.